Location. 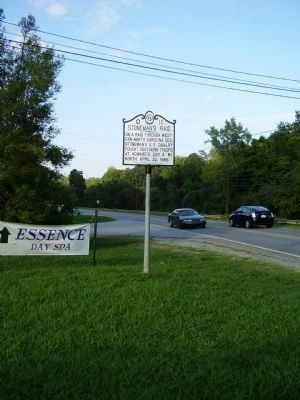 35° 13.72′ N, 82° 14.017′ W. Marker is in Tryon, North Carolina, in Polk County. Marker is at the intersection of Lynn Road (State Highway 108) and Old Howard Gap Road and Story Road, on the right when traveling south on Lynn Road. Touch for map. Marker is in this post office area: Tryon NC 28782, United States of America. Touch for directions. Other nearby markers. At least 8 other markers are within 3 miles of this marker, measured as the crow flies. Sidney Lanier (about 800 feet away, measured in a direct line); a different marker also named Sidney Lanier (approx. 0.2 miles away); Tryon Mountain (approx. 0.3 miles away); Harmon Field (approx. one mile away); Tryon Peak (approx. 1.1 miles away); Tryon Toy House (approx. 1.3 miles away); The Tryon Horse (approx. 1.4 miles away); The Block House (approx. 2.2 miles away). Touch for a list and map of all markers in Tryon. 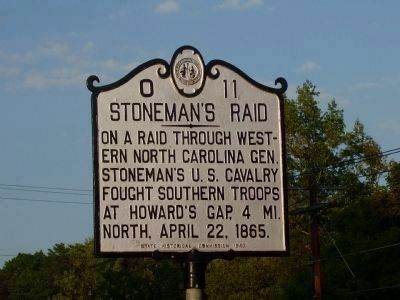 March 1865, toward the end of the Civil War, Union Gen. George Stoneman led nearly 6,000 cavalrymen through the western portion of North Carolina and southwestern Virginia from Tennessee in what is known as Stoneman's Raid. Credits. This page was last revised on June 16, 2016. This page originally submitted on September 7, 2008, by Stanley and Terrie Howard of Greer, South Carolina. This page has been viewed 1,074 times since then and 8 times this year. Photos: 1, 2. submitted on September 7, 2008, by Stanley and Terrie Howard of Greer, South Carolina. • Craig Swain was the editor who published this page.